This post is filed under Crackers, Dry, Hall of Shame (Taste), Nabisco. Might these be the new mouth stuffing saltine challenge cracker? I have a box of these on my desk and they are not that salty! 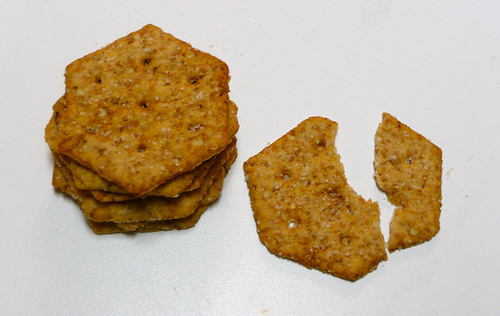 Occasionally there are a few in the box that have more salt grains on them, but overall they aren’t much different from regular wheat thins. Also, they are delicious! I eat them with hummus. Are you kidding!? I’m addicted to these things. I **love** them! Their line of cheese crackers (Wisconsin Cheddar, etc) are just as inedible … waaaay too much salt. I think that these taste awesome! 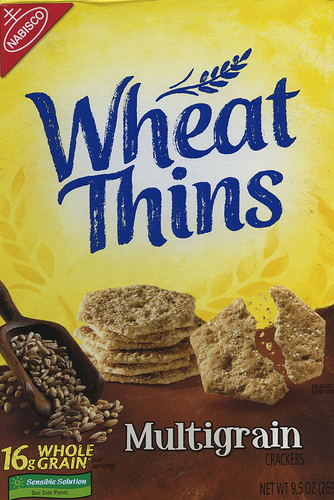 The box that I had was actually less salty than other types of Wheat Thins. I LOVE these w/ some slices of cheese. Your review is a bit harsh, I suggest trying them again to see if you notice a difference.